The Sin Eater first appeared in Unexpected Journeys, the BFS anthology published for the 2013 World Fantasy Convention. No Giveaway this week, nor probably for a while, as there’s going to be something of a redesign of the website going on over the next couple of months ready for stuff that doesn’t have dragons in it. 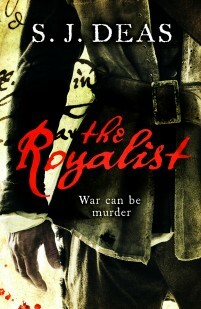 September 25th sees the publication of The Royalist, a historical mystery detective thriller thing set in the English civil war. Here’s the blurb and the cover. “William Falkland is a dead man. A Royalist dragoon who fought against Parliament, he is currently awaiting execution at Newgate prison. Yet when he is led away from Newgate with a sack over his head, it is not the gallows to which they take him, but to Oliver Cromwell himself. Cromwell has heard of Falkland’s reputation as an investigator and now more than ever he needs a man of conscience. His New Model Army are wintering in Devon but mysterious deaths are sweeping the camp. In return for his freedom, Falkland is despatched to uncover the truth. Notice the cunning use of a fake middle initial to totally hide who the author really is . . . oh, never mind. Then in October and November the Elite novel comes out in hardback and Empires follows it. So there’s going to be some rearrangement of the site to be less dragony and more with the spaceships and the muskets over the rest of summer. The Silver Kings has gone to my agent. Yay. Irritation of the week still gets to be shared between the Achilles tendon that still refuses to stop hurting and the willy-waving reviews. Speaking of which there’s a review of Barricade over here what I writ and what’s full of typos. This week it’s back to various alter-egos. Nathan Hawke is writing a short story. Then SJ gets to work on the second William Falkland novel, which will mean nothing to any of you since the first one isn’t out yet. Cover reveal coming soon though. This week, by special request, the giveaway is a little different. 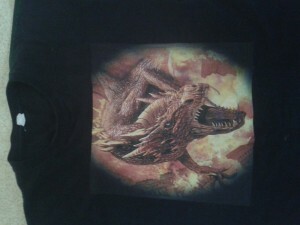 This week I’m giving away a Dragon Queen T-shirt, to be ordered and printed after the competition closes. I’ll be in touch with the winner about what size it should be. Usual deal – comment on this post before the end of July 5th and I’ll randomly select a lucky victim. 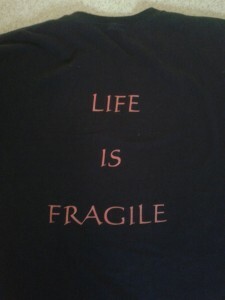 If you want to enter the competition for the shirt, tell me a T-shirt slogan, real or imagined, that amuses you. Although, though no one has yet complained about how long it takes me to get to the post office and post things, it can take a while and if you live abroad then it can take even longer. Sorry about that, but they do get there eventually. I am currently up to date with posting things.